Bucket list item: achieved ! While I didn't pre-broadcast this, 710 and I are (were?) in Florida for the last half of this last week. As noted many times prior, we are not great planners of vacations. But 710's vacation time doesn't roll over like mine does. He's on a use-it or lose it method. So we had to do something. The safe and easy choice was NYC, but we had done that already (and with the amount of snow they got, I'm ok with having not done that). For some reason, we ended up going to Florida. Orlando specifically. We are not Disney-o-philes like some people I know. And some of these folks are borderline committable due to their "all things Disney" mentality. For those gay grown men into it - and I mean, one of my friends goes 5-7 times.....per YEAR! - it's just creepy. That he hasn't named his dogs Mickey and Minnie is a downright miracle. But as soon as we made the decision, and because I'm a nerd, I was on-line looking to see if Space X had any planned launches from the Kennedy Space Center. They did...........and they didn't. The message was vague about a mid-December launch, with no date attached. What it hadn't said was that the scheduled date had already passed but the launch was scrubbed. So we hedged our bets and still planned on central Florida. The day before we left, I read Space X was launching the day we arrived. About 40 minutes after we would be wheels down. And KSC is an hour away from the airport. DANG! As wheels touched down in MCO, I went on-line to see if it was still on schedule. As it would turn out, that launch would be delayed again....until Friday. SCORE! Unlike the Shuttle launches, where you had to have reserved tickets, this launch allowed anyone to go to the viewing grounds who had a ticket to the center - first come; first served. Due to my excitement and over-planning, we were at the gates by 07:30, though said gates didn't open until 09:00. We were #s 10 and 11 in line. SCORE! The wait to get in wasn't horrible, and they let us in 15 minutes early. Then we rushed to get in line for the bus - which didn't start until 09:30. Then we got out to the viewing site a good 50 minutes before launch. 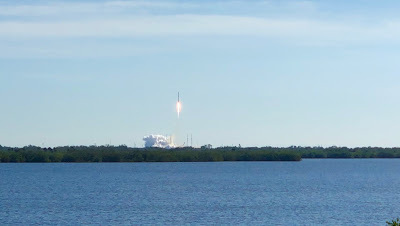 Traveling to Cape Canaveral, it was very overcats, but still ok to see a launch. As it would turn out - and as you can see - the clouds and the marine layer went away. 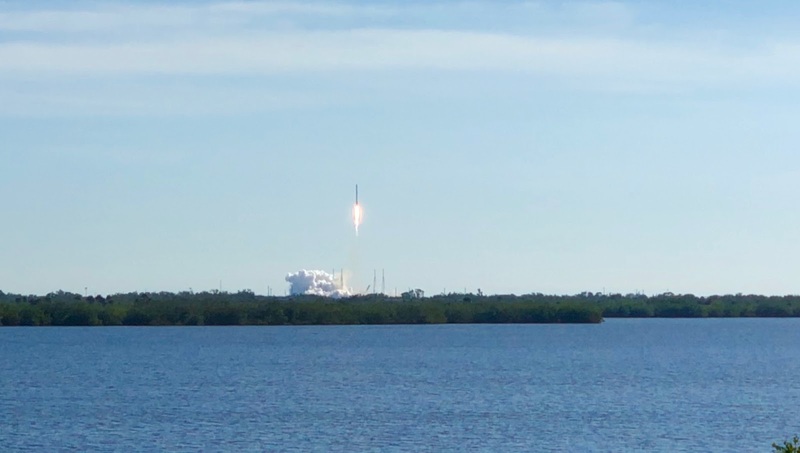 It was a perfect day to see a rocket go into space. The crowd was manageable for a few reasons: I don't know that Space X is that well publicized for throngs to come see. The other is: the launch had been scrubbed 2-3 times, so people might not have been willing to keep coming back. The stands were not filled. We had a great view of Launch Pad Complex 40, even though it was 6.3 miles away. Take off was on-time and went off without a hitch. The last time Space X launched a Falcon rocket from KSC, it exploded while still on the pad, rattling windows for 30 miles. Take off, of course, was amazing. But with the Falcon, it's about the first stage booster that comes back to Earth and lands upright back at Kennedy. THAT was amazing to watch and we couldn't have had better seats, as the booster landed in a site between two buildings.....where we had a direct view. Others were not as lucky to see that. Blobby - being Blobby - did video the launch, but not really the landing. I refused to watch the launch through an iPhone screen, so I hit 'record' and held the phone, but look at the launch with my own eyes. When I went back, I made sure the phone did too, hoping it was capturing everything. That worked pretty well. Blobby - being Blobby - fucked up the re-entry video. Parts of that event was more difficult to see until the rockets turned on to direct and slow down the landing. Blobby thought he had hit 'record' but I'd find out later, didn't. So when I hit 'stop', I really was hitting 'record', so I ended up with four minutes of my phone recording the inside of my pants pocket. Bother. Still, it was an amazing event. While he had been to Kennedy Space Center many times (remember: geek here!) we stayed for a bit after wards. They have a new Atlantis Shuttle building. KSC kept one of the Shuttles for itself and built and entire complex around the shuttle. It was great. We did a simulation for an actual take off..............though an Atlantis one, not a Challenger one. Later this week, I suspect you'll get video. Our internet connection here is not the best, so I'm not trying large file transfers until we are home....which we will be shortly after you all read this. More people should get close enough to see, hear and feel launches. If you'd posted that photo without writing the context I'd have missed seeing it. Despite that safe distance I'd imagine that the sound level would still have been quite formidable. As a kid (early 1970s) my grandfather used to take me to the beach out on Cape Canaveral. I could see the launch pads just a short distance away. There was just a simple chain link fence between us and the grounds around the launch area. I’m sure that no public is allowed that close anymore. I meant to tell you---our dog trainer here in Zanesville was at the launch with her kids.